After a decent night’s sleep, we ate a breakfast of fruit and breads at the B&B. 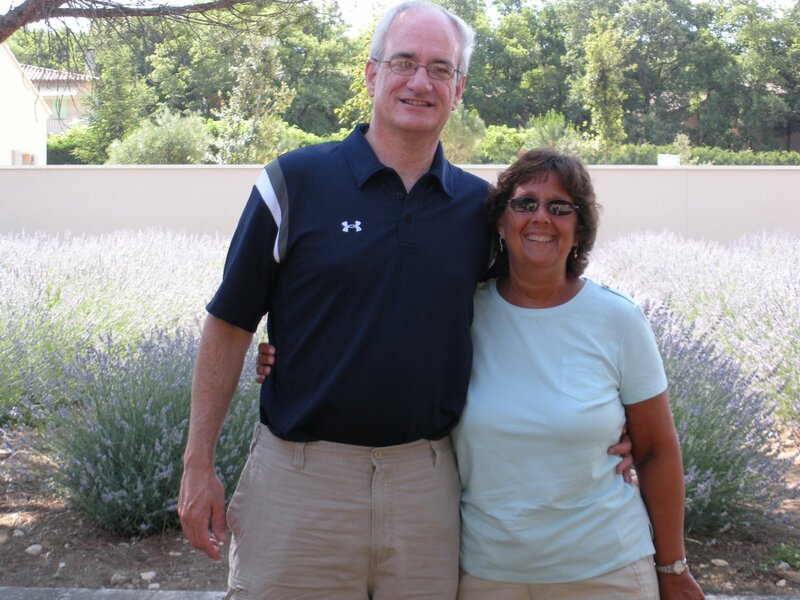 Our driver, Michelle, then took us our of Avignon, headed for the land of lavender. We stopped first at Musee de la Lavander, skipping the museum, while heading straight for the boutique. We got a lesson on the properties of lavender (good for calming, digestion, anti-bacterial, you name it), the difference between the real stuff and the cheaper lavendine, and of course, all the great products made with lavender. We picked out “only” a few things, so we rang up only a 51 euro tab. 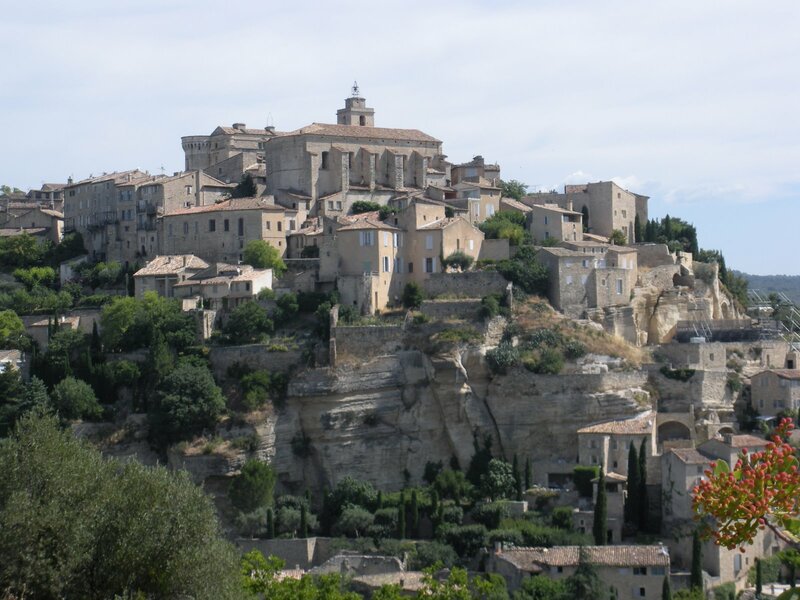 We then headed up the hills to the town of Gordes, which looked almost too much like a movie set. Beautiful old buildings, churches, and absolutely breathtaking views. 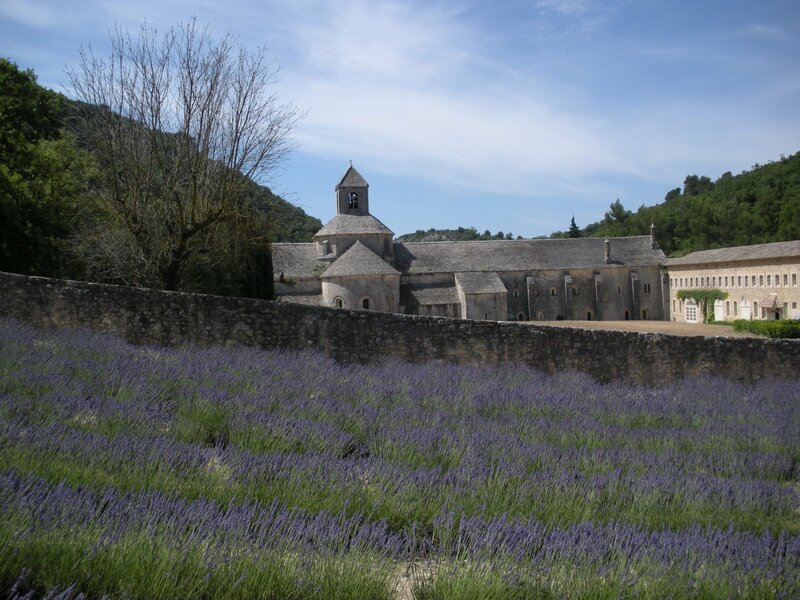 We then drove down the hill to the Abbaye Notre-Dame de Senanque with beautiful fields of lavender surrounding the abbey structure. Last for the daytrip was a quick visit to the town of Roussillon, where we grabbed sandwiches for lunch and dined outside. It was cooler away from Avignon, with the temperatures in the high 80’s, compared to 95 in Avignon. After we returned, we set out for an outdoor cafe so I could enjoy a beer, Ellen a Coca Cola Light. The sky turned dark and we got to see everyone scatter as rain came for 1/2 an hour or so. It cooled everything off, which was quite welcome. Dinner was at Resturant L’Opera Cafe, a short walk down the main street and right across from the carousel. Evenings attract great crowds of local and tourists, it was fun to people watch as we dined. Tomorrow will leave us with some free time in Avignon, to visit gardens and the famous bridge before starting the trip. This entry was posted on Saturday, July 4th, 2009 at 8:42 pm	and posted in Uncategorized. You can follow any responses to this entry through the RSS 2.0 feed.